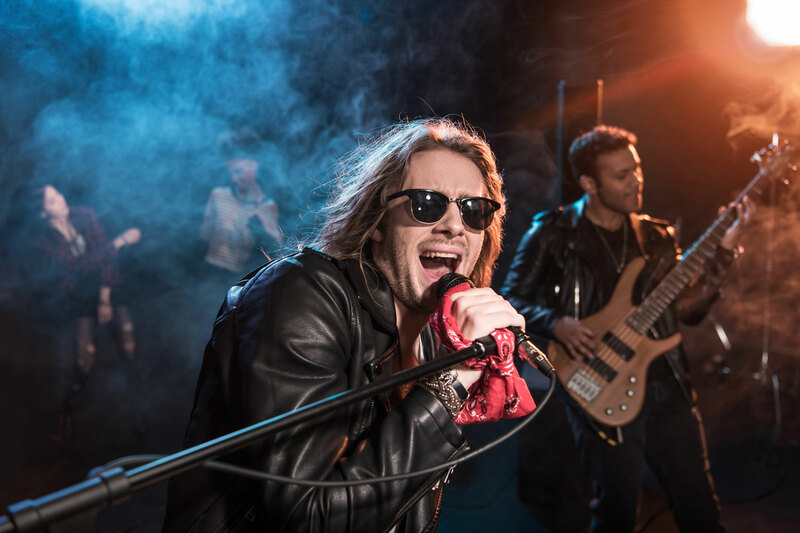 Cover bands can be a lucrative side gig for musicians today. Many corporate events, weddings, or private parties book them for a flat rate, i.e., no door percentage, nothing contingent on merch or drink sales, which equals more take-home pay in most cases. 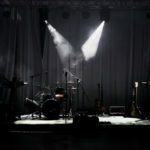 Like any musical venture, though, there are many things to consider before committing to a cover band; use this list to think it through. In this guest post, blues and rock musician Josh Urban shares the social media tactics he got from his recent railroad touring experience. The greatest advantage of being an independent artist today is ironically also its biggest challenge: Anyone can jump in the game. So while the playing field may be level, it’s crowded. Access isn’t the issue – recognition is. 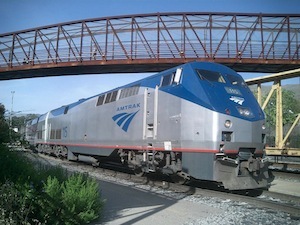 Josh used Amtrak to tour the East Coast. Good music and showmanship are vital — but here’s a radical idea: What if there’s even more that we can do? At the end of the tour, I assembled all of the photos posted into a giant collage, a collaborative view of the world as we saw it. 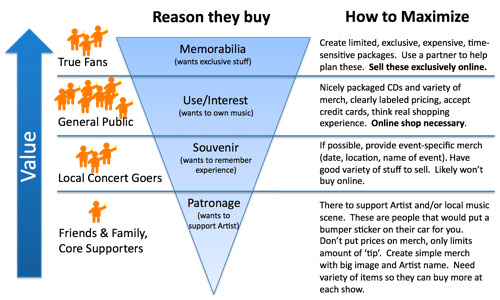 The question is: what can you do to create a unique experience for your fans? Ask yourself: Do I have interests outside of music I can draw on? Is there a cause I care deeply about? What else moves me? For a long time, I forgot the first word of the phrase “social media.” Unlike traditional media, social media allows conversation. Engagement with fans turns them into friends. People like to be heard, and to have others hear their opinions. Check out the comments section of a news article, and you’ll find folks debating viewpoints — and the input has little or no outcome on the story. It never seems to stop people, though! For me, I’ve never had much luck with asking people to remember things like “See this website on my CD? Go to that later when you go home and sober up, then follow the link, and like my page.” But if I’m putting on a colorful show, people are probably going to snap a few Instagram shots of me. There are many other ways, but just remember: the simpler, the better. I love hashtags, because you don’t have to know the person to interact, which is vital for building a fan base. By getting out of your comfort zone, you end up meeting people you would normally never meet. Future collabs anyone? With the rail tour, I was able to interest not just fans of blues music, but also people who were intrigued with the idea, or who liked any aspect of it, such as traveling, trains, adventure, or stories. It broadened my base, and made each conversation relevant to the project. And believe me, I told everyone about it, meeting great connections accidentally! It also made it much more interesting to traditional media sources. I was able to successfully pitch the tour to radio stations, newspapers, and even community television. Another question to ask yourself: Who else besides fans of your genre would enjoy knowing you? 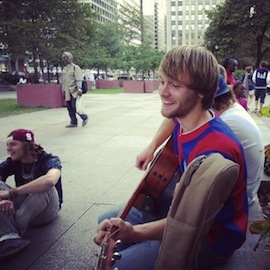 Remember to get busking permits ahead of time! I’m looking forward to applying those lessons — and others — when I tour again this week, this time on my Search for Good Tour. I’ll be touring by rail, playing children’s hospitals, street corners, cancer centers, and places that don’t have music. I’ll be looking for the people, sights, and sounds that rock the world and I’ll be putting some good on the news for a change. (You’re invited to join me, of course! Find some good, and post it with the #JURT hashtag!) I’ll be adding some other “cool factors,” such as bringing my home-built cigar box guitar and releasing an album on download cards in the form of a tour lanyard. What can you do to create your own experience? How can you involve people? How can you make it easy for them to join in? How will they express it in their own words? Who else will this appeal to? What will you learn from the project? I’d love to hear what you cook up! Leave a comment below with your social media ideas and questions. 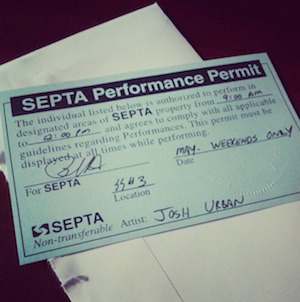 Josh Urban is currently recording an EP inspired by his first rail tour, and will be touring by rail again to support its release in May and June of 2013. He firmly believes all the world’s a stage, as shown on his Instagram feed. He can be reached via his website, Facebook, Twitter @DontJoshMe and Instagram @JoshUrban. In this guest post, full-time DIY musician Ari Herstand gives you tips on how make a profit while touring. Ari has opened for artists such as Ben Folds, Cake, Joshua Radin, Matt Nathanson and Ron Pope. 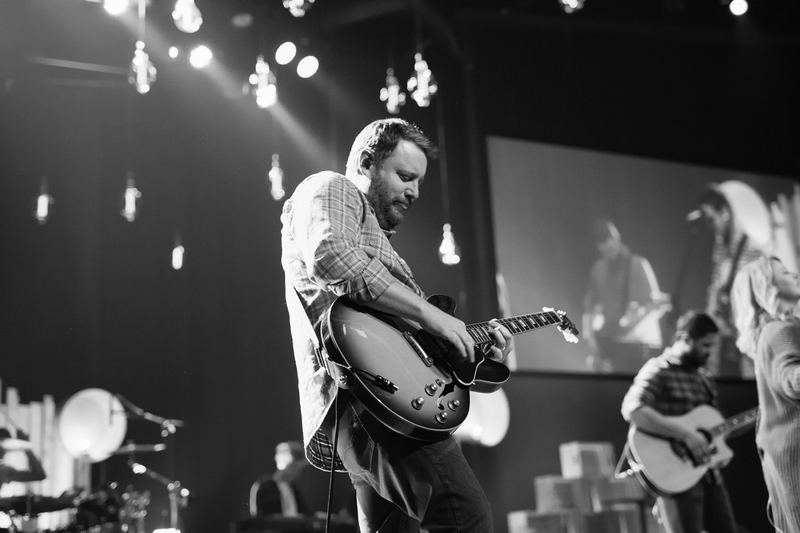 His songs have been featured on TV shows like One Tree Hill and various Showtime and MTV shows. His latest studio album debuted at #11 on iTunes singer/songwriter charts. 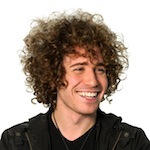 He writes an independent music business advice blog, Ari’s Take. I’ve played over 500 shows in 40 states. I’ve played every possible venue imaginable from arenas and theaters to living rooms and high schools. Every tour I go on is still a combination of all sized venues (well, not quite arenas as consistently as I’d like). Once I quit working at Starbucks years ago, I made the decision that I would find a way to make a living with my skills and talents that didn’t include knowing the proper amount of foam on a caramel macchiatto. I hit the road and since then I have learned how to make every tour financially successful. Let me say that again. Every tour that I have ever done, after expenses, has been profitable. It blows my mind that musicians tour and LOSE money. This is totally avoidable, but I hear many musicians just accept this as a reality of the road. Don’t. If you want to be a professional musician, you have to figure out how to actually make money with your music. Follow these tips on the 8 basics of touring. If you can think of anything else, leave me a comment below! Every show needs a purpose for the tour. Too many bands think that at every show the CEO of Atlantic Records’ brother will be in the house and he’ll make one phone call and turn them into superstars. That doesn’t happen. So once you accept that this is a business and it’s a slow grow and not a quick dash to play in front of “the right people,” it will change your mentality on the purpose of your tours. b) To gain exposure and build a fanbase. Every show I play I still put to this test. For the shows with the biggest amount of exposure (for merch sales), I’m willing to accept a smaller guarantee. The shows that won’t offer much for exposure, merch sales or career advancement, I need a much higher guarantee. But don’t get into the trap of convincing yourself that every show you’ll sell hundreds in merch and DON’T take free shows from restaurants or friends of your parents promising a big crowd and “you can sell your merch.” This is a trap and it almost never is as worth it as you think it will be. Play house concerts! These are some of my most profitable shows. If you’re a singer/songwriter it’s much easier. The promo is done by the host and most of the people that come (even just 20) buy lots of merch. Charge the host a guarantee of about $350 (but ask them to charge their guests $15 and if 24 people come they get a free concert). Every tour I include a few of these. 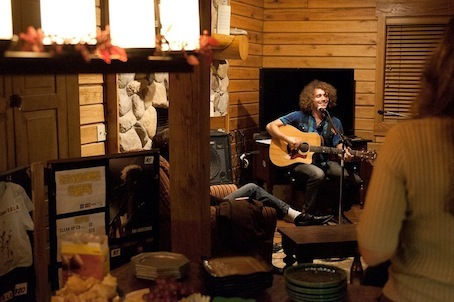 House concerts or living room concerts can be very profitable. Of course most of your shows will be a percentage of the door — so you need to promote each show in each town heavily! Once you have a tour made up of a healthy balance of (more) money shows and (less) exposure shows then you are ready to begin. Only bring people on the road who are absolutely necessary for your operation to work while still making a profit. If you can’t afford a sound guy at this stage, well, then don’t bring one. Even if they agree to do it for free, it’s not free. You’re gonna have to feed them, lodge them and once they see all the money coming in from the door or merch they’ll make it uncomfortable enough where you’ll get guilted into throwing them something. Merch is your #1 income generator on the road. Believe it. Some shows you’ll make next to nothing from the door, but hopefully you’ll be able to leverage those in the house to buy some merch. Make sure you always have someone manning your merch table from when the doors open to when people leave. If you can’t afford to bring a merch person on the road find a friend in that city (post status on Twitter and Facebook to request help) to run the table in exchange for free entrance to the show (or even a small % of sales). It’s worth it. Especially if you’re on a bill with multiple bands or are playing for hours, most people won’t stay until the end of your set. If they like what they hear (even after one song), but have to take off early and they want your CD, if no one is at the merch table to sell it to them, you just lost a sale. Get a credit card swiper (like Square – it’s free). I nearly doubled my sales with this. Gas can kill tours. Don’t tour in a larger vehicle than necessary and don’t pull a trailer unless ABSOLUTELY necessary. I know 5 piece bands that can fit all their gear and merch in the back of their van. The best way to save on gas is to make sure you’re not driving out of the way. No huge tour routing will ever be perfect, but keep the backtracking to a minimum (if ever). Don’t get hotels until you’re making serious money. And even then try Priceline “name your own price” (not getting a kickback but I SHOULD) — I get $45 4 star hotels that way. It’s a nice little mid-tour perk to get off of the beer stained couch for a night. Invest in an air mattress and sleeping bag so you can keep your lodging portable and all you’ll require is floorspace. You must (as a band) make a decision early on if you want this project to be just for fun or for profession. If everyone is on the same page that you want to be a professional outfit then you must act like it. Most venues will give you drink tickets. Don’t ever buy drinks at the bar you’re playing — it’s a waste of money and you don’t need it (BUT always tip your bartender on free drinks). When you stop to fill up you don’t need the $2 bottle of water or soda. Those add up. Get a water bottle and fill that up. If you’re out for awhile, go grocery shopping as a band. Buying in bulk obviously saves and if you bring a cooler along, you can spend more on ice and less on Subway. The road is a mix of saving money and making money (as is life), but it’s magnified when you’re on tour. Always keep coming up with ways to make more money (merch combos, house shows, PLAY COLLEGES, better targeted promo to get more to show up). Don’t tour to just say you’re going on tour. Tour to grow your base WHILE making money. If you’re still stuck and need more specific ways to get your tours to become even more profitable or want to embark on your big first tour, let’s Get Specific. And if you have questions or want to share your touring experience, leave us a comment below! Below you will find just a few of the ReverbNation Opportunities that we have brokered for our Artists. These opportunities consist mostly of performance slots at Festivals, Conferences, Awards Shows, Tours, and Clubs but also include Songwriting Competitions, Licensing Opportunities, Music & Video Reviews, and more. Artist’s can find these and more in their OPPORTUNITIES section of their ReverbNation Dashboard! ReverbNation’s goal is to keep providing value to the Artists at the lowest possible cost. We always try to broker Opportunities with no Submission Fees but sometimes a Promoter needs to charge a Submission Fee and since ReverbNation does NOT take a % of the fee, we often times get a very reduced rate for our artists! IC Artist Agency looking for bands for College/University Bookings. A&R Worldwide and AllAccess.com’s Worldwide Radio Summit is only accepting submissions though RevebNation and will select approximately 12 artists to showcase in front of high level radio, label, publishing, TV/Film and brand executives. Tinderbox Music Festival in Brooklyn looking to book female artists and female fronted bands – last day 8/5/11. 2Racks Rap and R&B Contest Series now in 5 cities looking for talent. Bands needed for Festival in Saugerties, NY. Winter Folk Festival looking for artists/bands. Rock U Festival in St Louis looking for bands. Get featured in Underneath Magazine. Get featured in Surrender Magazine. many others available in the Artist’s Opportunity Section of their ReverbNation Dashboard. At least 50 Reverb slots available at 16th Annual Millennium Music Conference & Showcase. Open up for Ne-Yo and others on the MISSION ONE VOICE tour (on US Military Bases for our troops). Win up to $150,000 in cash and prizes from the International Songwriting Competition. At least 50 Reverb slots available at the Mid-Atlantic Music Conference. The 8th Annual IAMA (International Acoustic Music Awards) is now accepting entries. The Konnected Tour is looking for at least 4 Reverb Hip-Hop/R&B/Soul artists to play in several cities throughout the southeast – all expenses paid. At least 10 Reverb slots available for ReverbNation artists on the Perfect Attendance Stage at the A3C Hip Hop Festival in Atlanta. 80-100 Reverb slots available at the 13th annual Heart of Texas Rockfest during Music Week in Austin, TX. At least 50 Reverb slots available at the RedGorilla Music Fest during Music Week in Austin, TX. 40 Artists (20 Alt/Rock and 20 Urban) to perform at The 2012 Indie Music Fest. Reviews and Features at one of Google’s Top 10 entertainment magazines on the web, I Am Entertainment Magazine. REVERBNATION SPOTLIGHT on SHMEK-U! – 2 Reverb artists/week get their Music in 180+ colleges and universities with an average weekly traffic count of 9 million people. Get Your Music Promoted on ROCK THIS! during the months of July thru September 2011. Compensation ranges from $100 to $1,500 per band at Buda October Fest. Nominations for the Hollywood Music in Media Awards 2011 are under way. The IC Agency selected Sword Swallower Dan Meyer, Parish County, Melodime, Transit Vocal Band and Chelsea Green and the Green Project for its Agency Roster and College Bookings! More performers are still needed. Telesma was selected to play at Camp Bisco with The Disco Biscuits, Cut Copy, Wiz Khalifa, Bassnectar, Pretty Lights, Death From Above 1979, MSTRKRFT, Ghostland Observatory, Yeasayer and 100+ more artists! Johnny Spanish, Lyriciss, Dee-One and Big Rec are the first 4 Reverb artists slected for A3C Hip Hop Festival. Creation Northwest selected Heather Stanley, Cam & Drew, Vizion (AKA The Trailblaza). Insigniya was selected to play at the Liberate Festival. Submissions require a free ReverbNation account and ReverbNation Press Kits. If you do not have a ReverbNation Press Kit, activate your 30 day free trial now! If you have an Opportunity(s) that is valuable to some or all of ReverbNation’s 1.5million artists, please go to Festivals/Events/Tours/Opportunities and choose Festival/Event. That will take you to the application, and after you fill it out, a rep will be in touch shortly! If you are a Venue, please check out the only comprehensive Venue Application on Facebook, Venue Profile App on Facebook. Any questions, give us a shout! Every Monday we will post some information regarding the ReverbNation Opportunities we have brokered for our Artists. 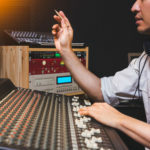 These opportunities consist mostly of performance slots at Festivals, Conferences, Awards Shows, Tours, and Clubs but also include Songwriting Competitions, Licensing Opportunities, Music & Video Reviews, and more. Since ReverbNation does not take a % of the Submission Fee that may be charged by some Promoters, we are often times able to offer Opportunities that have no Submission Fees or very discounted Submission Fees. Our goal is to keep providing value to the Artists, at the lowest cost possible! Dee-1 and BIGREC are two ReverbNation Artists that have been selected already to perform at this year’s A3C Hip Hop Festival. Submissions are still open and at least 4 more ReverbNation slots are still available at A3C Hip Hop Festival. Submissions require a free ReverbNation account and active subscription to ReverbNation Press Kits. If you do not have a ReverbNation Press Kit, activate your 30 day free trial now! If you have an Opportunity(s) that is valuable to some or all of ReverbNation’s 1.4million artists, please go to http://www.reverbnation.com/controller/main/signup and choose Festival/Event. That will take you to the application, and after you fill it out, a rep will be in touch shortly! Trying to plan a tour? Looking for all the music venues in a specific area? Need recommendations of venues that fit your type of music and the capacity that fits you best? Try Gig Finder right now for free! It’s one of the largest free venue databases in the world, and can even recommend venues that fit you based on where you’ve played in the past, where comparable Artists like you play when they tour, and venues that book your type of music. To get a list of recommended venues that fit you best, open the “Get Recommendations” tab and enter the location for which you want venue recommendations. It also offers advanced options, such as finding a venue in a different town that is similar to one you already play in your town, or finding a venue that has hosted a specific band similar to yours. 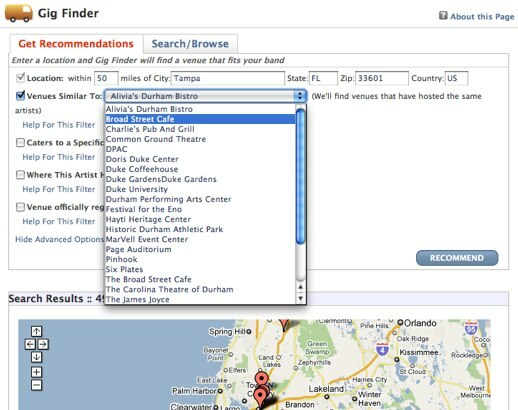 When you press the “Recommend” button, you’ll get an exhaustive list of all of the venues in the area you specified that match your criteria, sorted by how well they fit you. Of course, if you have never entered any shows into the system, it will be more difficult for Gig Finder to find the best matches. But, you can still search for venues similar to the ones you would play in your home town or that have hosted specific Artists. From there, you can choose multiple venues with the checkboxes, and click “Send Press Kit To Selected Venues” and get one form which you can use to e-mail all of your chosen venues. When you send the ReverbNation Press Kit (RPK) to those venues, we track which venues open and play the music in your press kit for you. 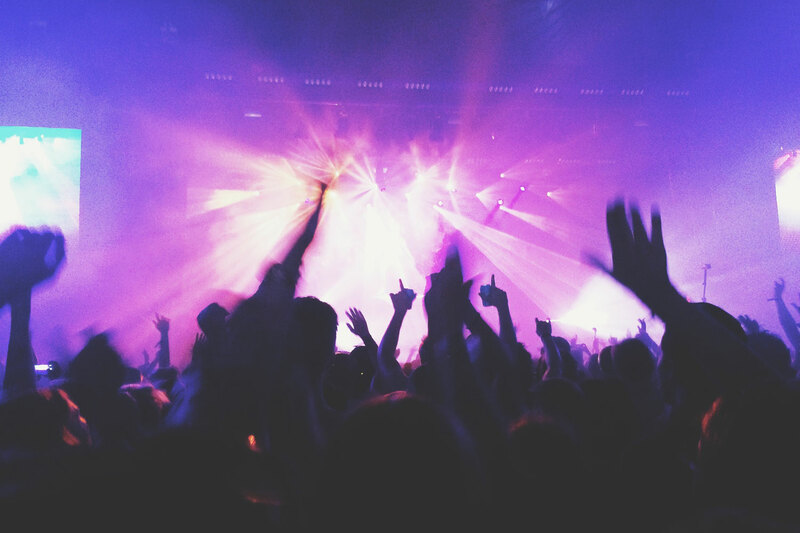 With Gig Finder, planning a tour and sending out booking inquiries has never been easier. Gig Finder saves you time and money. Why pay for a venue database when you can use our free Gig Finder service to help you find the right venues for you? Let us know about the shows you’ve booked using GigFinder in the comments!